The Brown Bears have won the MIT side of the two-part Coed Showcase Semifinals, the qualifying regatta for the Showcase Finals to be sailed at St. Mary’s College in two weeks, October 20-21. The top-9 teams from the event will advance to the finals. Another 18 team regatta, held at Harvard, took place simultaneously to decide the other 9 team that will sail in the Showcase Finals. 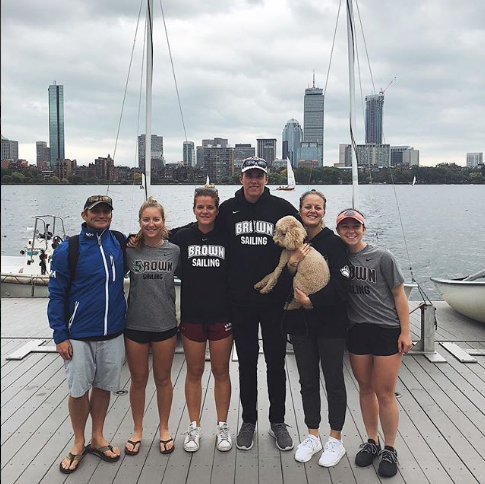 As Mr. Charles pointed out in the regatta report, Brown finished second in both divisions due to consistent sailing from Patrick Shanahan ‘19 with Julia Reynolds ‘21 and Ragna Agerup ‘20 with Abigayle Konys ‘19 in A and B Division, respectively. Despite extremely uncertain conditions, especially on Sunday, Shanahan and Reynolds only had 2 races outside the top-10, Agerup and Konys did the same. The effort was enough to beat Hobart and William Smith Colleges 182 to 194 after 16 races sailed in each division. 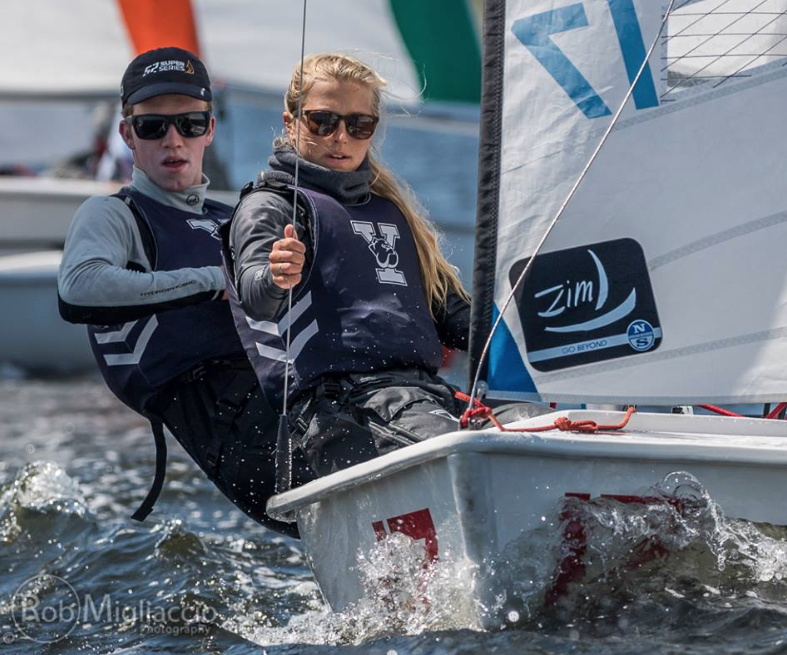 Matthew Kaplan ‘19 of Bowdoin continued an impressive start to the season, sailing with Louisa Lundgren ‘19, getting the A-Division win with 77 points. Jacob Rosenberg ‘20 and Kathryn Booker ‘19 of Stanford won B-Division with 86 points. The regatta at MIT qualified teams for the Showcase Finals, a revision on the former fall season doublehanded finale, the Atlantic Coast Championship. The top 9 teams from each of the two Showcase Semi-finals will advance making, perhaps, for a more merit-based championship. The Showcase Finals will also, after their qualification last weekend, include Stanford, a perennial top-10 team. The qualifying teams this year will be, in order of finishes, Brown, Hobart and William Smith, MIT, Bowdoin, Stanford, Tufts, Charleston, Dartmouth and Coast Guard. From the Coed Showcase Semifinal 2, held at Harvard, sailing alongside the regatta at MIT, Yale, Georgetown, Roger Williams, Harvard, Navy, Jacksonville, Boston University, Boston College and Old Dominion qualified, finished first through ninth, respectively. Yale ran away with the 20 race regatta, winning both divisions and beating Georgetown by 26 points, 87 to 113. Despite racing only a course-length away from the event at MIT, this regatta completed 12 races less than the other qualifier. “Mike O’Connor refused to let marginal races off and though there were 16 or so races started in each division, we ended with 10 tasteful races in each because so many races were called off,” said Leonard. Nicholas Baird ‘19 and Sonia Lingos-Utley ‘21 of Yale won A-Division, posting only one race outside the top-9. Baird is the early frontrunner for the Marlow Ropes College Sailor of the Year. But, perhaps more impressive was Sophomore Shawn Harvey ‘21 and Junior Graceann Nicolosi’s performance in B-Division. The tandem posted no races outside the top-8 and won 3 of the 10 races sailed. With Harvey and Lingos-Utley improving, what seems like, every weekend coupled with Baird and Nicolosi’s experience and talent, this Yale team could be the team to beat in college sailing. In women’s sailing there were two interconference regattas sailed over the weekend, the Susan Rogers ’75 Memorial Regatta at Cornell University and the Stu Nelson sailed at Connecticut College. Once again the best women in the nation were divided by geography as anticipation grows for next weekend’s Women’s Showcase Finals. Cornell University won the Susan Rogers on home waters. The Big Reg sailed impressively, beating neighbor and rival, William Smith. The combined division event was headlined by William Smith senior, Bailer Carter, one of, if not the best women’s sailor in the nation. However, it was Daisy Holthus ‘21 and Brooke Shachoy ‘22 sharing the helm behind senior leader Kimberly Wong ‘19, who stole the show, winning the regatta by 35 points over second place finishing Carter. Holthus sailed the first 6 races with Wong, winning 4 and finishing with all top-3’s. Shachoy picked up where Holthus left off with 3 bullets in 9 races, and only one race outside the top-3. Cornell won the regatta by 21 points, 115 to 136 due to such a dominant effort by Holthus, Shachoy and Wong. Yale University edged College of Charleston by 8 at the Stu Nelson at Conn College. Despite Junior Alie Toppa and senior, Annabel Carrington’s impressive win in A-Division, Yale proved more consistent, finishing second in both divisions sailing Christine Klingler ‘20 with Kira Woods ‘19 in B-Division and Louisa Nordstrom ‘20 with Claudia Loiacono ‘21 in A.
Toppa and Carrington showed why they might be the best women’s boat in college sailing this year, winning the division by 13 points finishing with only 2 races outside the top-3 in the 9 race series. Sophie Hibbem ‘19 and Megha Malpani ‘19 of Brown won B-Division. Brown finished 3rd overall with 85 points.